Leptospirosis is an important zoonotic disease in the Pacific Islands. In Fiji, two successive cyclones and severe flooding in 2012 resulted in outbreaks with 576 reported cases and 7% case-fatality. We conducted a cross-sectional seroprevalence study and used an eco-epidemiological approach to characterize risk factors and drivers for human leptospirosis infection in Fiji, and aimed to provide an evidence base for improving the effectiveness of public health mitigation and intervention strategies. Antibodies indicative of previous or recent infection were found in 19.4% of 2152 participants (81 communities on the 3 main islands). Questionnaires and geographic information systems data were used to assess variables related to demographics, individual behaviour, contact with animals, socioeconomics, living conditions, land use, and the natural environment. On multivariable logistic regression analysis, variables associated with the presence of Leptospira antibodies included male gender (OR 1.55), iTaukei ethnicity (OR 3.51), living in villages (OR 1.64), lack of treated water at home (OR 1.52), working outdoors (1.64), living in rural areas (OR 1.43), high poverty rate (OR 1.74), living <100m from a major river (OR 1.41), pigs in the community (OR 1.54), high cattle density in the district (OR 1.04 per head/sqkm), and high maximum rainfall in the wettest month (OR 1.003 per mm). 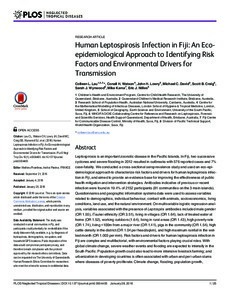 Risk factors and drivers for human leptospirosis infection in Fiji are complex and multifactorial, with environmental factors playing crucial roles. With global climate change, severe weather events and flooding are expected to intensify in the South Pacific. Population growth could also lead to more intensive livestock farming; and urbanization in developing countries is often associated with urban and peri-urban slums where diseases of poverty proliferate. Climate change, flooding, population growth, urbanization, poverty and agricultural intensification are important drivers of zoonotic disease transmission; these factors may independently, or potentially synergistically, lead to enhanced leptospirosis transmission in Fiji and other similar settings.